In addition to SuperyachtsMonaco, 44m Sibelle is now jointly listed for sale with Ocean Independence for an asking price of €18.5 million. She is the third hull in Heesen’s 4400 series and was launched on 11 April 2008. The semi-displacement motoryacht was built in aluminium by the Dutch yard and has an interior styled by Omega Architects and the owner’s architect, Michael Labazov. The spacious main saloon has ample seating with a Bang & Olufsen entertainment system and a Kaleidescape server for on-demand video and audio. She is able to accommodate 10 guests over a main deck master suite, two VIP staterooms and two twins, all with en suite facilities. She is currently owned by a serial Heesen owner, who had a 50m launched by the yard in January this year, also named Sibelle. 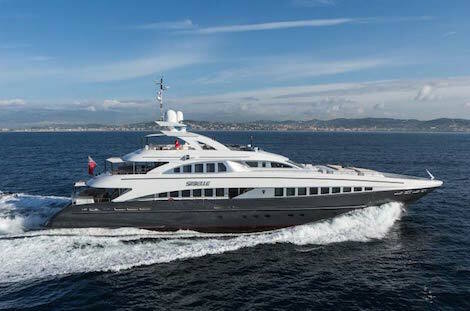 The 44m has only been operated under private use - with the main usage concentrated to the summer - and is in near new condition following a soft refit and winter works. The chart above shows other Heesen re-sales over the last two years of a similar LOA and age at the time of sale. 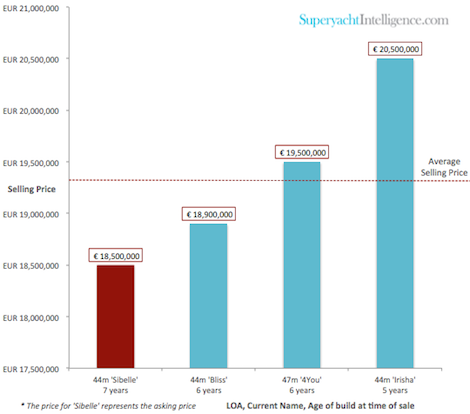 The asking price is evidently in line with historical re-sales and, whilst she is the eldest from the four, she also has a lower asking price than the selling prices / final asking prices of the three completed sales.